A great season for the Helensvale Pacific Pines Hawks!!! 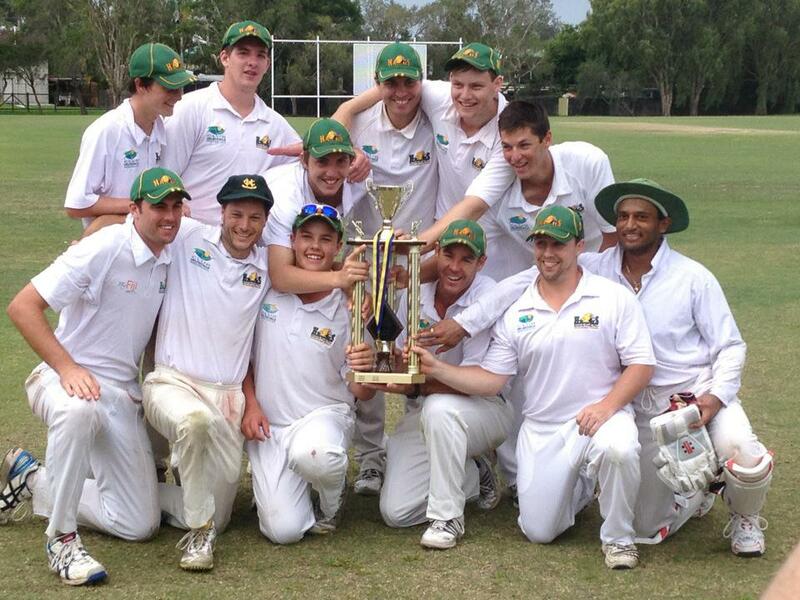 2nd Grade Premiers for 2012/13! Back row: Jack Baird, Danny Edwards, Brad Carter, Aaron James, Ben Harris, Ryan Maloney. Front row: Matt Gillett, Brett Burke, Rhys Coombe, Paul Baird (captain), Jamie Weston, Anand Jayaraman. The Helensvale Pacific Pines Cricket Club yesterday sealed their first premiership in 20 years after defeating Queens in a tense match at Arthur Angove Oval. Opening batsman Matt Gillett (87*) was the star of the show, carrying his bat through the entire innings in a display of incredible patience to anchor the Hawks to victory. Earlier, an outstanding team performance in the field had restricted Queens to 112, with English leg-spinner Danny Edwards picking up four wickets. The teams appeared evenly matched heading into a contest with plenty at stake. A 2nd grade premiership would give the Hawks a possible chance to return to the 1st grade competition. Meanwhile, Queens had finished last in the top division, and could only guarantee a place there next season by taking out the 2nd grade crown. Both sides were full of confidence following convincing semi final victories in games restricted to 40 overs a side; minor premiers Queens chased down Palm Beach Currumbin’s 9/119 in just 14 overs, while Helensvale comfortably took down second placed Surfers Paradise to win by seven wickets. After a month of regular wet weather, the sun shone during grand final week and allowed for excellent playing conditions. Queens skipper Brett Amos won the toss and elected to bat on a reasonable looking pitch and a quick outfield. Hard-hitting Queens opener Peter Goodchap got the home side off to a good start, immediately putting the bowlers under pressure with three early boundaries. The score had moved to 0/18 when Hawks vice-captain Ryan Maloney made the breakthrough with the key wicket of Goodchap for 16, caught by Gillett at fly slip. Fellow opener Chaminda Perera and wicketkeeper Ben Mytton were just starting to build a threatening partnership when left-arm quick Ben Harris clean bowled the latter for eight. Brad Carter soon after snared took two quick wickets, including that of Perera, caught behind by Anand Jayaraman for 11. When Edwards was introduced into the attack, he immediately looked likely to strike and did so by dismissing former Hawks first grader Scott Cormie, caught at short point for four. Hawks stalwart Brett Burke returned for a lively and much improved second spell and left Queens reeling at 6/72 when he had Jackson Slater caught at the wicket. Left-handed batsman Matt Brown, who came in at number five, finally found some support from Michael Karlhuber, with whom he set about closing in on the team’s hundred. However, the combination of Edwards’ potent leg spin, a turning wicket and huge pressure from close-in fielders saw the demise of Karlhuber and then Mitch Foster. With Queens struggling at 8/99 at the tea break, there was already a sense of excitement amongst the Hawks squad. Nonetheless, there was still plenty of work to be done, with Brown still at the crease. Further adding to the drama, Jamie Weston was required to take up wicketkeeping duties for the first time in Hawks colours as Jayaraman’s troublesome back became a factor. Harris was reintroduced into the attack to get the afternoon session underway and made a decisive blow just three balls after the break. The home side slumped to 9/99 as Brown’s strong resistance (34 off 75 balls) came to an end, caught at slip by Hawks captain-coach Paul Baird. Amos and Brook McAdam fought hard, adding 13 for the last wicket but the innings came to a close when Weston stumped the latter, much to the delight of the Hawks supporters. That wicket gave Edwards excellent figures of 4/18 off 10.3 overs, taking his season tally to a phenomenal 42 wickets. The other stars of the bowling department were Harris with 2/13 (7) and Carter with 2/15 (5). The home side had managed just 112 but had built a reputation of being a bowler-heavy team. With just under two hours left in the day, there was a big opportunity for Queens to get back into the contest. The Hawks’ run chase got off to a horror start when Jayaraman was adjudged LBW to Amos on the second ball of the innings, giving the medium pacer his 33rd wicket of the season. Gillett, on his return to the side, began patiently working through the disciplined new ball bowling with Aaron James, until the latter was run out in a mix-up. Paul Baird and Weston were both quick to settle into their natural attacking styles in short but entertaining stays. When Weston departed in the 19th over, the visitors were in a precarious position at 4/34. However, Gillett and U17s skipper Rhys Coombe combined solidly to get through to the end of the day without further loss, taking the score to 4/56 off 29 overs. In the process, Coombe notched the impressive milestone of 1000 runs for the club. As the action returned on a hot and sunny Sunday, the pair continued where they had left off the previous night, gradually adding another 20 runs before Coombe was caught at slip off the bowling of Foster for a valuable 21. When Foster continued his fiery spell with the wicket of young gun Jack Baird soon after, the game was once again in the balance at 6/79. The key factor was that the tall figure of Gillett remained at the wicket, having been let off twice by dropped catches. Edwards survived a few play and misses early on and started to lift his scoring rate. Every run was being nervously ticked off and when the pair took the team into triple figures, anticipation of success began to sweep through the large Hawks faithful. With the finish line within sight, Edwards fittingly brought up the winning runs with a boundary wide of mid-on. Members young and old were delighted and congratulations began. However, celebrations had to be tempered as the determined Queens outfit gave a last-ditch attempt to steal an outright victory. Edwards departed for 15 immediately after the first innings win had been secured. Not long afterwards, Gillett reached his fifty and was greeted with long and well-deserved applause. Carter’s brief stay was ended by Perera’s leg spin, prompting the tea break. As play resumed, the subsequent partnership between Gillett and Maloney (11*) saw a rise in tempo with overs quickly running out. By the time 75 overs had been bowled, Helensvale had amassed a score of 8/174 – and a crucial 62-run first innings lead – with some late hitting from Gillett taking his score to an unbeaten 87 from 230 balls in an innings that will go down as one of the Hawks’ all-time great performances. Queens were faced with the unlikely task of erasing the first-innings deficit, building a lead and bowling their opponents out all within approximately an hour and a half. However, their cause got off to a good start as Goodchap belted 18 off the opening over from Edwards, including two massive sixes. The spinner had his revenge in his next over though, with quick glovework from Jayaraman stumping Perera, before Goodchap was caught by Paul Baird at mid-off. Wickets tumbled quickly from there onwards with Burke claiming two wickets and when Foster’s cameo of 25 was ended by a Harris thunderbolt, the result was inevitable. At just after 4pm, Amos pulled the pin at 5/59 (off 8.3 overs), meaning that Hawks celebrations could properly get underway. In a very competitive grand final, it was Gillett’s monumental innings that made the difference – earning him the player of the match medal. Baird and Amos gave gracious speeches, and finally, the Hawks were presented with their first premiership trophy since their 1992/93 triumph. It was smiles all round, with celebrations set to head long into the night and the following day. By Connor O’Brien, March 18, 2013.